Whether a new build or a renovation, choosing the right heating system is a big decision and one that needs careful consideration. Energy usage and obviously heating costs will be affected by the decision that you make. Underfloor heating, combined with liquid flowing screed, is the single most cost effective and efficient way of heating any living space. 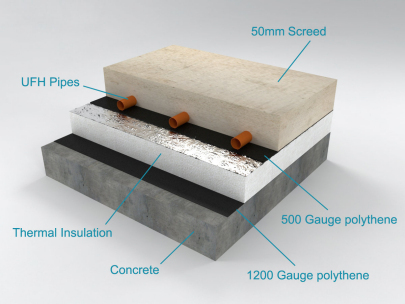 That being said, what kind of underfloor heating system is going to be right for you and your home? The two types of underfloor heating you will encounter are based on electric and water, respectively. 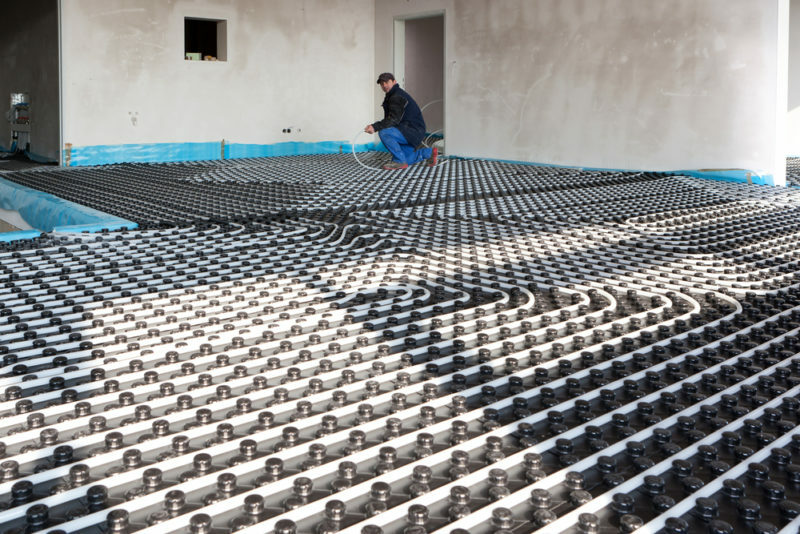 Water based underfloor heating involves the laying of water pipes beneath a flooring, preferably liquid flow screed because this is the most energy efficient thanks to its exceptional heat transference properties. Heated water is passed through these pipes in a similar fashion to central heating systems, and the heat from these pipes passes up through the flooring and into the room. Naturally, the faster the heat can get through the floor the better as this helps heat the room faster, saves energy and money – this is precisely why liquid flow screed flooring is recommended. Electric underfloor heating systems heat the floor directly, using either electrical matting or a network of electrical cabling. This method is generally faster than water based systems because the floor is heated directly, as opposed to indirectly – again, liquid flow screed is preferred here also, and for the same reasons as with water based systems. How do water and electrical heating costs compare? Generally speaking, water based underfloor heating cost more to install than their electric counterparts. That said, when it comes to actual running costs, water is generally cheaper than electricity. This means that a water based heating system could well be more cost effective over time. When both underfloor heating systems are compared to more traditional heating methods, such as radiators, then they both more energy efficient than the alternatives. This is due to the fact that both systems run at lower temperatures and suffer much less heat loss. If underfloor heating is something that you are seriously considering, it is very important that you find out as much as possible about the different systems and which you can afford to have installed. The latter is important because a wet system installation can cost around £18 per square meter and the electrical system can cost £15 for the same area. That isn’t the end of the charges, either. Electrical and plumbing connections can run to £240 for each zone with a water based system, whereas an electrical system is closer to £180 per zone. Another question you should ask yourself is, do you even need underfloor heating? If you rarely have the heating on anyway, for practical reasons rather than financial, then paying for an underfloor solution is probably not worth it. However, if your home does need heating but costs are unreasonably high, then an underfloor system could be just what you need.